Still have Presents to Wrap? I know...Christmas is over. But hey...some of you probably still have a few presents to give or will give presents throughout the year, right?! 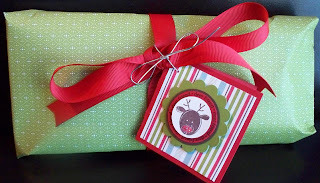 So here is an idea to wrap your presents...Stampin' Up! style. 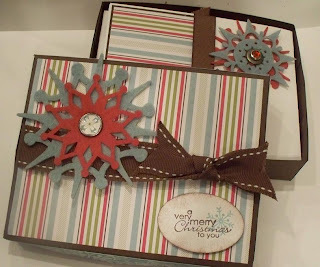 :) And yes....the present inside is even Stampin' Up! stuff. :) Anyway: I just took a piece of Designer Series Paper and wrapped the present with it. 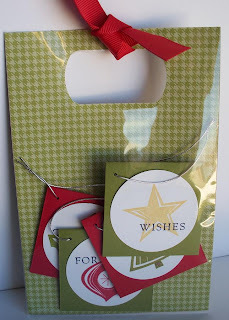 Then tied some fab-o ribbon around it and made a tag. And there you have it. It's card kit time again! 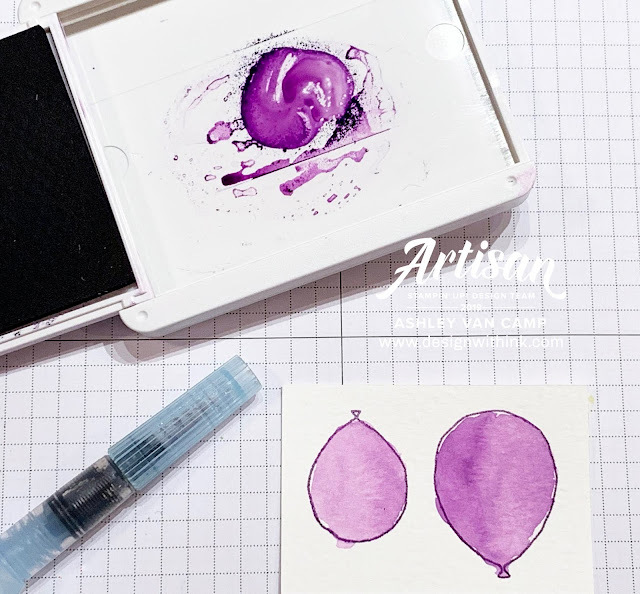 You will LOVE this stamp set and these cards! 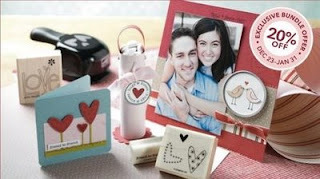 Each month, the card kit also features both a Stamp Set of the Month and an Accessory of the Month. If you purchase the card kit, you may also purchase these items at 20% off. 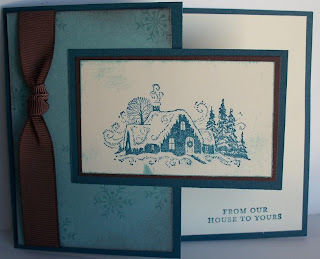 Orders for the Card Kits must be received by January 15th. You will receive your kits by the end of the month. 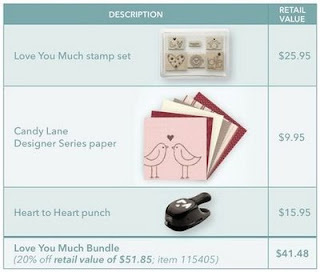 The bundle comes with the stamp set, punch, AND the amazing Candy Lane Designer Series Paper. When the new catalog comes out in January, you will be able to order these items individually for the retail price. Now is the only time they will be available at the bundle price of 20% OFF!!! The bundle retails for $51.85 but you pay just $41.48 with the 20% off! If you would like to see some darling samples made with this bundle, click HERE. To qualify for the free shipping option, your order must be over $70.00. So feel free to order online HERE if your order does. If you need me to combine your order with others I am placing, feel free to email me at: designwithink@gmail.com to make sure you can take advantage of the free shipping! I will have special prizes for those that order this bundle from me as well....so don't miss out!!! 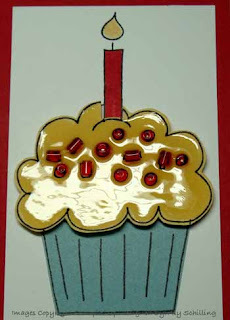 To make this card all I did was punch out a few circles...one was 1 3/4" and one was 1 1/4". Then I cut a strip of silver card stock (yes...silver! 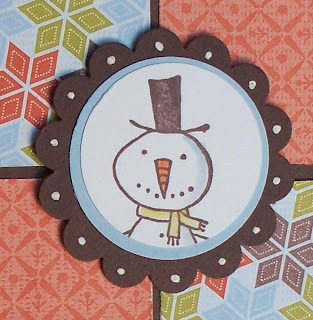 I think it gets overlooked in the Stampin' Up! catalog, but it really is beautiful!) to about 3/4". 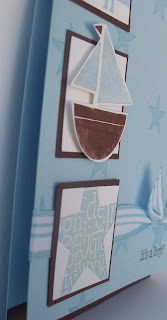 Then I used the scallop edge punch and scalloped the whole strip. 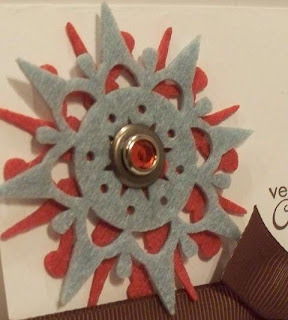 Then I just cut off a portion of it, adhered it to the top of my circle and the main ornament was completed. 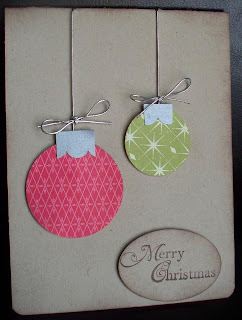 :) Then I just attached some silver elastic cording, tied a bow, adhered the ornament on with a dimensional, and VOILA! :) Some sponging and a sentiment, and you're done. Hope you enjoy! I colored him and gave him a little shadow with a blender pen and ink pads. Basically...you smoosh the lid down on the ink pad before you open it up. This gives you some ink on the lid. Then you just use the blender pen to pick up some of the ink and color like you would with a marker. I used Kiwi Kiss for the scarf, Tangerine Tango for the nose, and Basful Blue to do the shadow. Enjoy! Let me know if you have any questions!!! Big Shot fun for Club!!!! From December 9th-December 23rd, ALL orders over $70.00 GET FREE SHIPPING!!!!!!! You are welcome to combine orders with friends, or order it all yourself! :) Contact me if you would like to host a party with your friends so you can all take advantage of this deal!!!! FREE SHIPPING IS AWESOME! :) I'm so excited I don't even know what to do with myself! :) Let me know if you have any questions!!!!!!!! 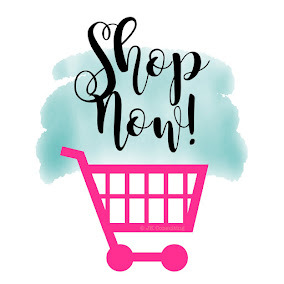 Click here to shop all day, any day!!! RETIRED STAMP SET LIST IS HERE...10% OFF!!!! The day has come. The new catalog begins on January 19th. So 'tis the season to retire some stamp sets. It's always sad for me, but EXCITING because of the new ones coming! 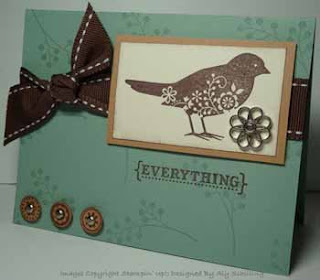 :) And this time.....STAMPIN' UP! 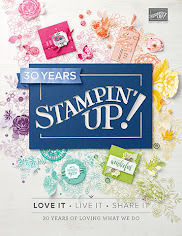 IS OFFERING 10% OFF ON ALL RETIRING STAMP SETS!!!! This promotion runs from December 9th through December 23rd!!!!! Whoopie!!!! Now is definitely the time to get those retiring sets you have been wanting! Enjoy and let me know if you have any questions!!!! CLICK HERE TO SHOP ALL DAY ANY DAY!!!! ***Remember: these stamps sets will only be available until Jan. 18th. This is just a little gift I packaged together for a Holiday Boutique. I forgot to take a picture of them out of them bag! But they are so cute. Basically...you take a binder clip (you know those things that you hold bunches of papers together with...they are usually black) and cover it with Designer Series Paper. 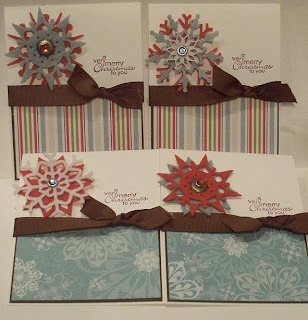 Then I added some ribbon to the silver holder portions. When you set them down on the the flat side they can be used to hold photos, a place card, a fun season greeting, anything you want to keep cold. :) (Ok...if anyone knows that quote...we can be friends! :) It's a quote from "Tommy Boy" if you didn't know what I was talking about! :) And we can still be friends even if you didn't know that!) Anyway: you can hold anything like that in there. 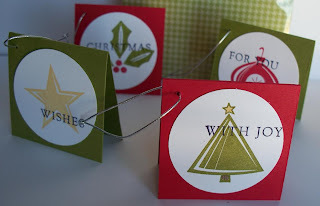 It would be a fun way to label all your holiday dishes for all the holiday parties you are having also! :) Or package a few together like this for a holiday gift. 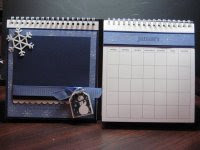 COME JOIN US TO MAKE A 6x6 CALENDAR!!!!! RSVP by Monday – December 8th. Please let us know when you RSVP which date you will be attending and how many kits you would like. Register a friend that we have never met and receive a free gift for you and your friend. "Kara married her husband Hutch Henrie less than a year ago (about 7 months). They were so in love and happy. Recently, the newlyweds were involved in a tragic accident. I believe Kara was the driver and she swerved to miss something in the road, but was unable to keep control of the car. Her husband was thrown from the car and died shortly after. If this story isn't heartbreaking enough there is more; Kara was a couple months pregnant when she lost her husband. Not only that,but they did not have life insurance because his company didn't offer it, and she will shortly, if she hasn't already, lose the health care benefits her husband had through his work. The financial burden on top of the emotional and spiritual heartache is too much for someone to bare on her own. There has been an outpouring of love for Kara and her family, but I feel like we can do a lot more. She has to deal with so much more than I can imagine. Kara's story has really struck me to the point that I cannot lie down to go to sleep without thinking about her and what she is going through right at that moment. I do not know Kara personally, I know her sister-in-law a bit but I have such a strong feeling that I need to help her. I wanted to do all I could anonymously, but I feel I could do a lot more by asking for YOUR help. The Henrie family has lost 3 members of their family in less than a decade: Their sister at age 21 to a car accident, their mother within the past year or so to breast cancer and now their brother to another tragic accident. I know that Heavenly Father must feel like this family is strong enough to endure the pain and struggle they have, but I feel like we can help ease the basic needs of Kara's and help her to focus on the things she needs to in order to get through this hard time. I think about the baby that is such a gift from our Heavenly Father, but which might feel like such a burden and she must have so many mixed emotions about her situation. It was supposed to be such a happy time for her and her husband to be starting a family together, and I feel like she can find peace eventually, but with the stress and burdens she has I feel like she needs our help. I know these are tough economic times for a lot of people, but I also know the blessing of giving yourself to a deserving effort. Here is how you can help: There are 2 separate trust funds set up at Zion's Bank and America First, email me if you are interested in donating to one of these and I will send you all the information you need. I am also taking cash or check donations in her name, Kara Henrie, as well as cards, gifts,etc. If you know companies or businesses that would like to help out please let me know and I will do all I can to support them in helping Kara. Please remember her this Holiday Season and find someway to help a part of renewing hope in this devastating situation." So there is the story. It's so sad and I feel so bad for her situation. If you would like to help at all or need more information, have questions, whatever....please email Emily at givebig33@gmail.com. 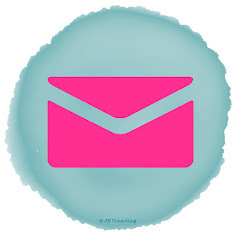 You are welcome to email me at designwithink@gmail.com as well. Even if you can't donate money (and any bit would help! ), I am sure she would love a handmade card from you so she knows the love and support that exists for her and that people are thinking about her. (Hint, hint! :) ) So if you would like to do this, feel free to get in touch with me and I will give you my address to send the card. Then I will gather them all up and get them sent to her as they come in. Thanks for taking the time to read this! Please let Emily know if you have any questions (givebig33@gmail.com) or me (designwithink@gmail.com ). Happy Holidays!!! So I've seen these circle lay outs all over. And I decided to jump on the bandwagon and make my own Christmas version. I just have been LOVING this idea. And I will say....I love it Christmas style as well. They are SO EASY to do. 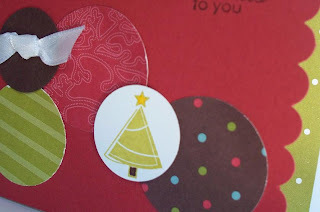 Just punch out different sized circles in different color card stock and Designer Series Paper, and layer them on your card. 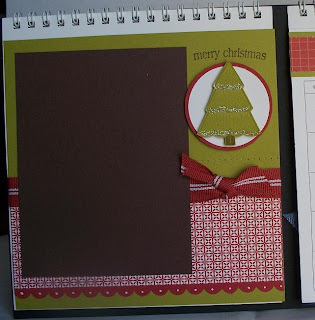 I included a stamped tree as well. 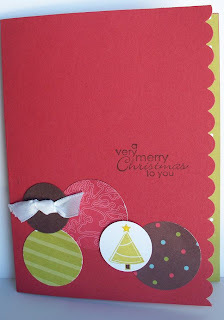 Then I scalloped the edge and put another piece of card stock down the inside of the card. (You can't see it so well, but it is the Kiwi Kiss Patterns DSP.) Go ahead...make one yourself! :) They are too much fun! 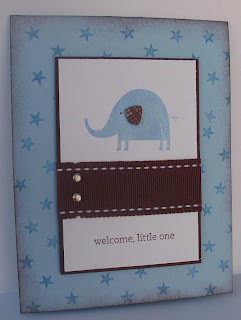 A little blue and brown to announce a little one! My cousin (well...my cousin's wife, but she's MY cousin too! :) )asked me to come up with a few baby announcement ideas. She's having a baby in about 3 months. OF COURSE I was excited to help! Here are a few ideas I gave her that she didn't end up picking. I won't post the one that she wants to do until after the baby is here and announcements sent out. :) I tried to keep all the cards from having too much bulge or anything. I didn't want her to have to pay extra postage for all the announcements she sends out. Hope you enjoy! And if you are looking for a baby announcement idea...hope this helps! 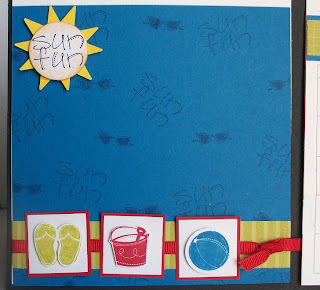 Or if you are looking for a card layout...hope one of these helps as well! 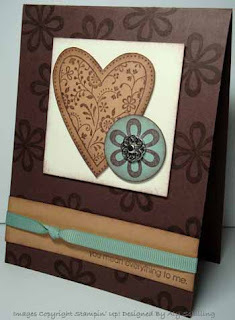 :) With stamping...it would be so easy to change any of these layouts into something that works for your purpose! I actually really like this layout. 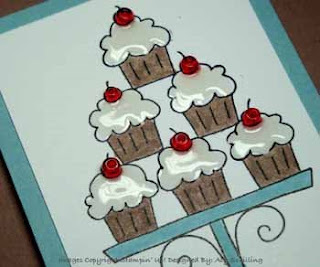 I went with different blues and Chocolate Chip on all the cards I did. This idea came from this card. 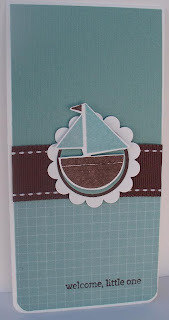 I used my square punches and then for the sailboat, I cut that out and popped it up on dimensionals. 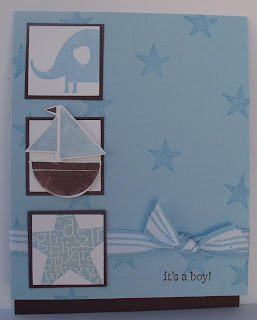 And then I LOVE LOVE that Bashful Blue striped ribbon that I think is SO baby boy. TOO CUTE, I think anyway. :) Also...the small stripe of Chocolate Chip on the bottom is actually on the inside. I just cut a small amount off the bottom of the front card. That way...you can see the Chocolate Chip on the inside when you open it. So the colors here are Bashful Blue and Chocolate Chip. 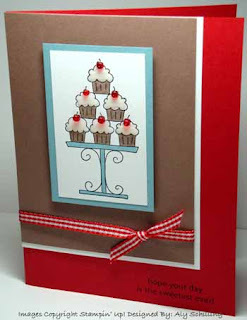 So this card is 1/2 Designer Series Paper and 1/2 Textured Card Stock. 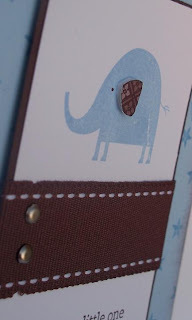 I tried to get a pic up close to show you the textured card stock, but I don't think I really captured it. SORRY! 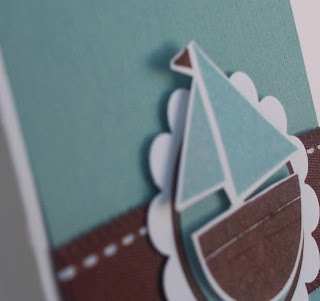 I love textured card stock though. It really does add just the right touch to projects. But I also LOVE this sailboat. Too cute! :) And I love the size of this card. 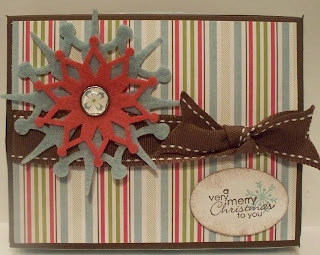 It fits in the Small Open End Envelopes that Stampin' Up! sells. Doesn't cost extra in postage or anything but is a fun and unique size. The colors here are Baja Breeze and Chocolate Chip. I guess I'm repeating myself, but I think this one is fun too. :) I got this idea from this card here. I just made a few changes. I really like the 2 brads on the ribbon. 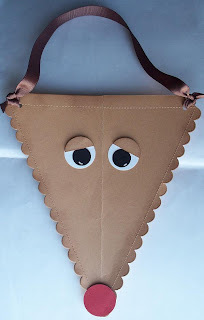 And I cut the ear from a scrap piece of Chocolate Chip Patterns Designer Series Paper. And the whole center piece is up on dimensionals...but you wouldn't necessarily have to do that part. The colors here are Bashful Blue and Chocolate Chip again. Anyway: it was fun coming up with some ideas. Thanks for the inspiration I found on Splitcoast, it made it a lot easier too! So grateful for my AWARDS!!!! THANK YOU for my award! Sorry that I haven't posted this already! With being out of town for Thanksgiving, I haven't posted this yet. And I ended up receiving this award from a few people this last week! 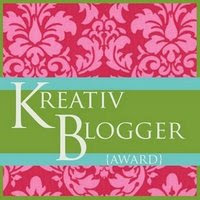 I have received this Kreativ Blogger award from Robin Merriman (I met her at Founder's Circle) and she has a great blog HERE, so go check her out! I also received this award from Megan Dunn (my FABULOUS downline!) 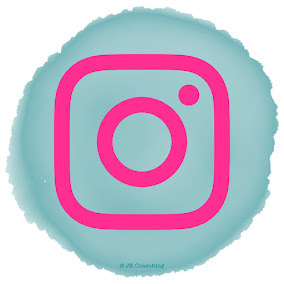 and her wonderful blog is HERE that you have to check out! 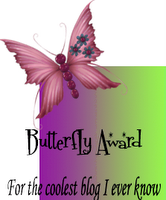 I also received this award from Jenni (whom I just met through her blog) so check out her fabulous blog HERE. Then I also received this blog from Meredith (whom I also just met through her blog) and she has a wonderful blog HERE! Thank you gals for nominating me! 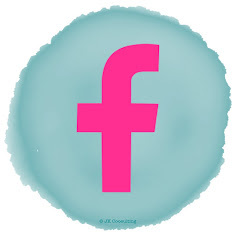 I love all of your blogs too! I know I need to nominate five people so I will narrow it down and update this later tonight. Then I also received this award from my fabulous friend in Australia, Kristy Young. Check out her blog HERE. Thanks Kristy! You are awesome and I appreciate the award! I need to nominate 8 people so same as before....I will update later tonight. THANK YOU FOR MY AWARDS! It means a lot! So I made this box before Thanksgiving, but didn't have time to get posted. So here it is! 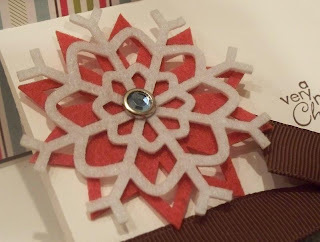 I have to say....I LOVE these felt flurries! I think they are so great and add so much to a project. 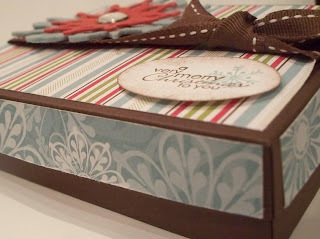 This is a box I made to go with 4 cards and envelopes. 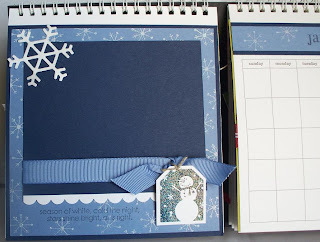 The snowflakes go great with Ski Slope Designer Series Paper, which is what I used here. This is the top of the box. In the middle of the snowflakes I put a Build A Brad. These are AMAZING! You just punch anything out using a 1/2" circle punch, put it on the metal post, and then put the clear bubble on top. Voila! A custom brad for whatever your project is! For the center of this brad, I punched a circle out of another sheet of Ski Slope Designer Series Paper. Here is the box lid off the box...with the cards inside. A side view of the box. A close up of the Felt Flurry with the Build A Brad. 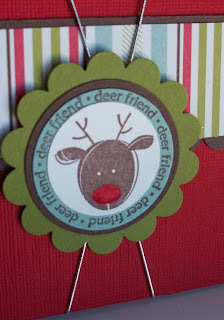 This is a close up of just one of the cards. 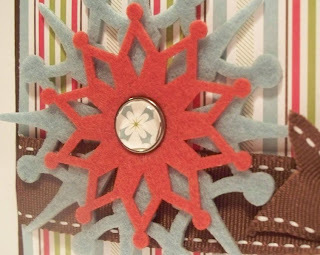 Close up of the Felt Flurries. In the middle of 2 of the Felt Flurries, I put just a Rhinestone Brad. In the middle of 2 of the Felt Flurries, I put a Jumbo Eyelet and then a Rhinestone brad in the hole of the brad. 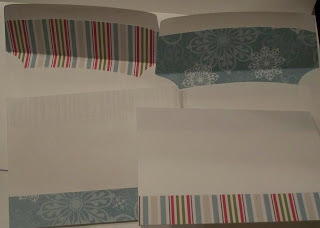 I even lined the envelopes! Wow....I'm going on the way with this one! 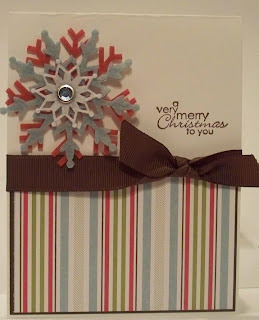 :) But I lined the inside with the same DSP pattern that I put on the cards. And then I put a strip of DSP on the bottom of the front of the envelope. 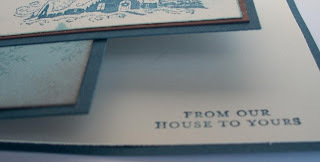 This is how it opens....the inside of the card is where the greeting is. Happy almost Thanksgiving! I'll be out of town when this posts, but still wanted to make sure you received some "holiday trinkets" while I was away! 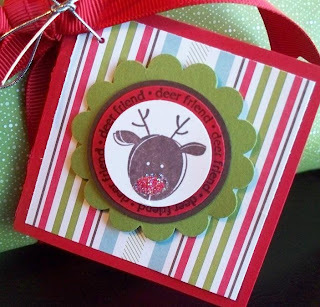 :) So here are some fun Tags in a Bag made with the Holiday Trinkets stamp set! Enjoy! AHHHHHH!!!! I'm so excited!!!! 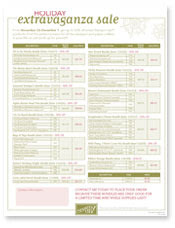 The Holiday Extravaganza Promotion is UP AND RUNNING! I can start taking orders at midnight. 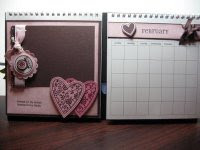 Go to my website... http://www.ashleyvancamp.stampinup.net/ and place your order. Or email me at designwithink@gmail.com and I will place it for you! Click on the flyer HERE to see the bundles and their prices! HAPPY SHOPPING!!!! Let me know if you have any questions!!!! Thanks, Brandi, for the inspiration! :) You are awesome! 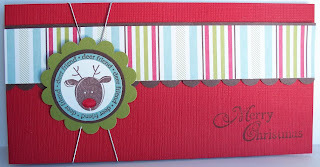 December Card Kit of the Month!!!! 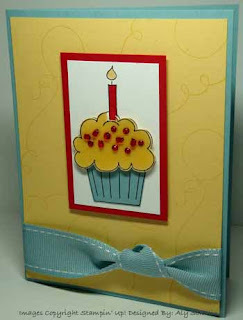 Get ready to make your birthday cards for the year! If you don't have everything--place a product order with your kit (don't forget about the discount on the "featured products!") 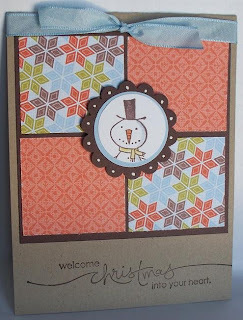 Or--you can use the card kit to create your own designs using other stamps and inks that you already have--the choice is yours! 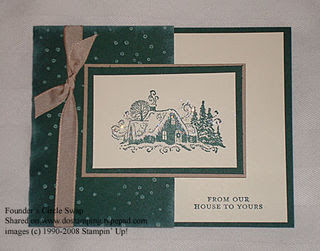 Orders for the Card Kits must be received by December 15th. You will receive your kits by the end of the month. Please Note: I am glad to ship kits directly to you! If the kit needs to be shipped, there will be an extra $4.80 shipping charge.